Along with Amazon's Kindle platform, Google Play Books is one of the few ebook platforms which will let you upload your own ebooks to its servers and then download them and read them in an app. I was recently asked for help on how to upload the files, so I thought it would be useful to document the steps involved and share them. I don't use Google Play Books for my main reading app, but I have uploaded several ebooks, and I can tell you that their are 3 different ways to go about it. Before we get to the instructions, let's first cover the limitations. Epub/PDF: Only PDF and Epub files can be uploaded, and not any other type. DRM: You can't upload ebooks with DRM; Google won't let you (according to Google's own troubleshooting guide). File Size: Only files smaller than 100MB can be uploaded. A Thousand And One: Google will only let you upload 1,000 files. Perhaps the easiest way to upload files is through the web browser on your PC. To start, you'll need to have an account with Google. 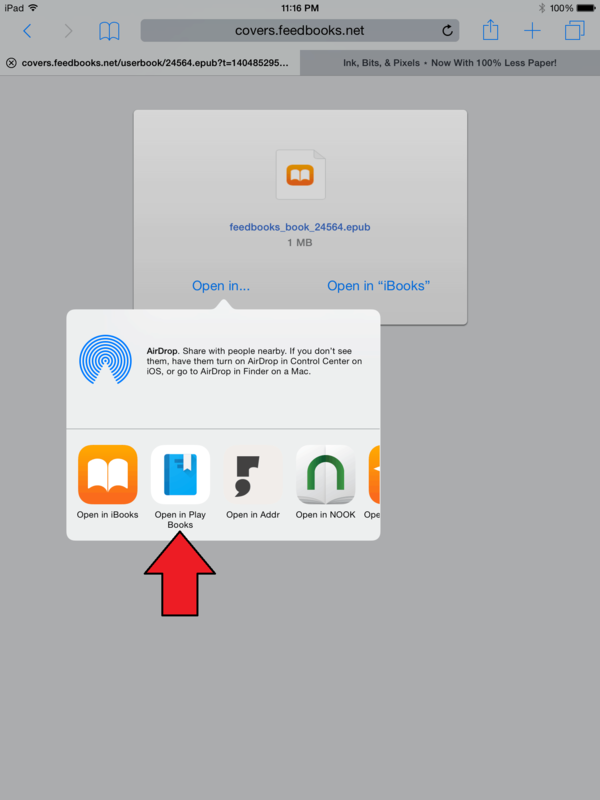 Open the My Books page on Google Play Books, and look for the upload button. After you click the button, you should see a window like this. You can click the button and select the file you wish to upload, but I like to open a folder in another window and simply drag the files from one window to my web browser. It's convenient and simple. Once you've uploaded the files, you'll need to wait a while for the upload to finish. If you have a large file, this can take a while. And once the file has been uploaded, you should be able to read it in your web browser. In addition to uploading through your computer's web browser, you can also upload on your iDevice. 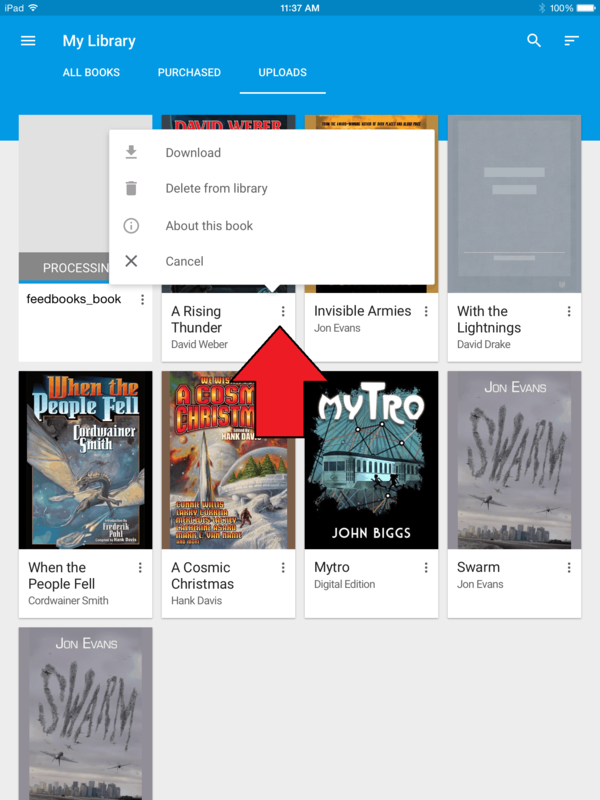 You'll need to have the Google Play Books app installed first, and you'll also need to have logged into your Google account before you try to upload a file. 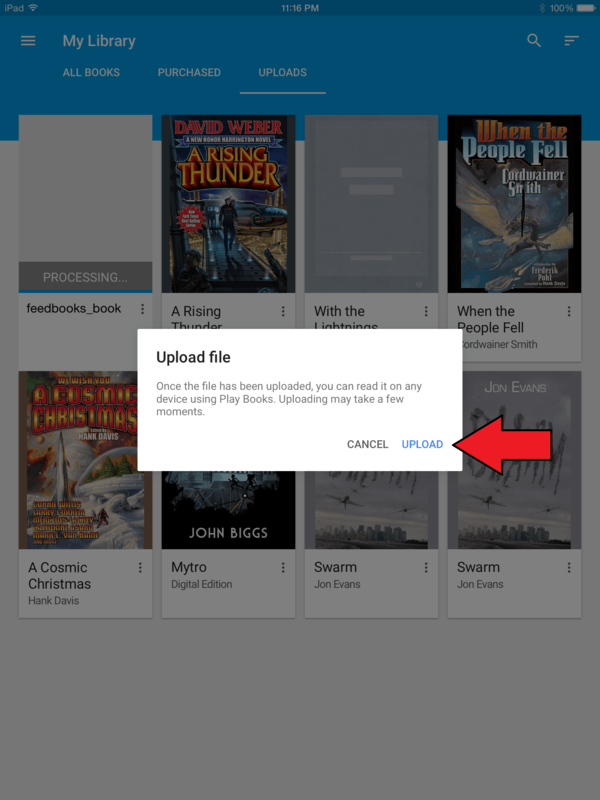 Oh, and just so you know, there's no option for selecting an ebook from inside Google Play Books and choosing to upload it. You'll need to choose the ebook while you're in Safari or another app and select the option to open the ebook in the GPB app. The actual upload process will take some time, depending on the file size and your internet. You can upload an ebook to Google Play Books from your Android, but like the process for iDevices this process does have a few quirks. You'll need to have the GPB app installed first, and you'll need to find the ebook in another app and choose to upload it to GPB. And if you are uploading a PDF, you'll first need to go into the GPB app and enable the option before you try to upload the file. Once you've down that, find the ebook you wish to upload in a file manager, your download folder, etc. Select it, and you should be prompted with the option to upload the ebook to GPB. Choose that option, and the ebook should be uploaded automatically. Once you've uploaded your ebooks, you can read them in your app or web browser almost immediately, but before you do that you might want to also take the extra step of downloading the ebook. 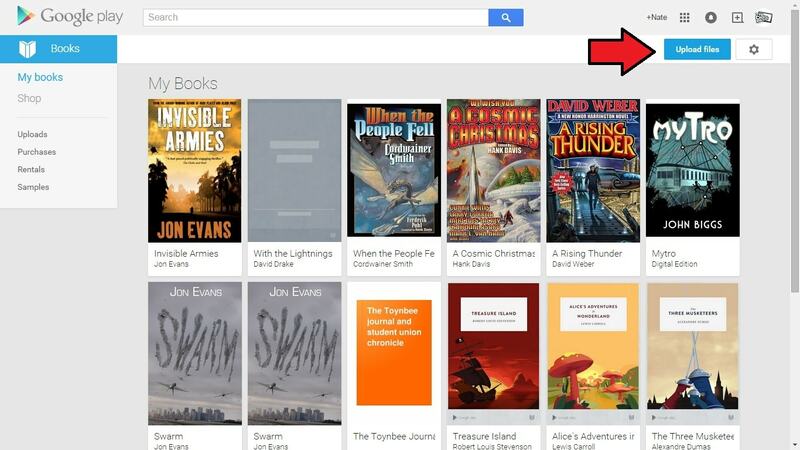 One of Google's less endearing quirks is that they don't automatically download an ebook when you read it. Instead, they'll send you bits and pieces of an ebook as you read it. 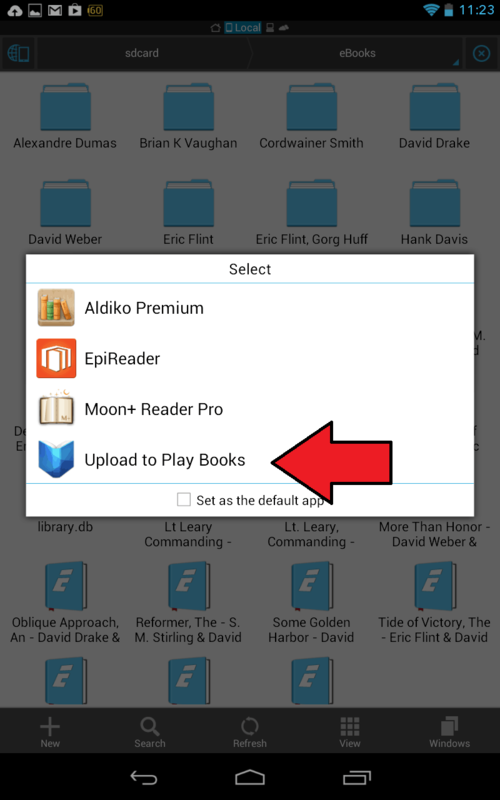 If you want to use your mobile device to read an ebook offline, you'll need to specifically tell the Google Play Books apps to download the ebooks. Luckily, the process is pretty simple. Simply find the ebook you wish to download, and press the "3 dot" menu icon. This will bring up a menu for the ebook. As you can seem on Android the option is labeled "keep on device" while on the iPad the option is appropriately labeled "download". If you have questions, the comment section is open. But you might also want to head over to the forums; that might be the better venue for tech support. Thanks. I don’t know why they’re not working. Edit: They should be working now. Does this support an equivalent of Amazon Whispersync? I double checked, and I think it does. My reading position in the web browser was synced to the Play Books app on my Android tablet. Just to be clear, I did not buy this ebook from Google, and I just now opened it on the Android tablet for the first time. And the location synced. Just a second while I try to see if bookmarks sync. Annotations (highlight, note, bookmark) also synced. Until now, I have passed on some very attractive eReaders, because of the absence of an autosync facility. I currently read on my Kindle and my iPhone and iPad Mini, the last two using Kindle apps. The books are from a mixture of Amazon and other sources. The Whispersync facility is important to me in that scenario. It would seem I can now start to review my eReader options. Just to be clear, I don’t think you can’t actually download the books you uploaded, in their original file form. You can only read them online via the Google Book app/webapp – however, once you’ve uploaded them there, they’re stuck in Google Books. Thanks! My books weren’t showing at the library, now I just uploaded via web browser. Thanks again! Welcome! I’m glad it helped! Who all could get access to my uploaded books? Yes…can I give access to my uploaded pdf’s to anyone? I have pdf files I have created myself I would like to share through my website. Yes, but you will need to use a different service. 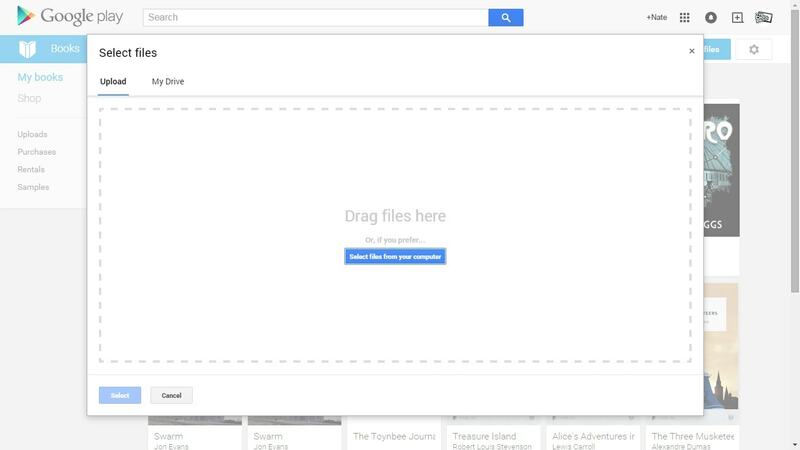 If you upload the file to Google Drive, you can then choose to share it. I accidently deleted a photo book that I had saved to Google play books. How can I restore it? Late to the dance, but I wanted to ask the source. Once I put these books on the Google Play Books storage, can I download them onto my iPad so I don’t need to be online to read them? I am looking around the app to find that and I don’t see it. I will be living in an RV soon and will not always have a connection. And I don’ want to use my cell data for books when it is also my TV stream. Thanks. 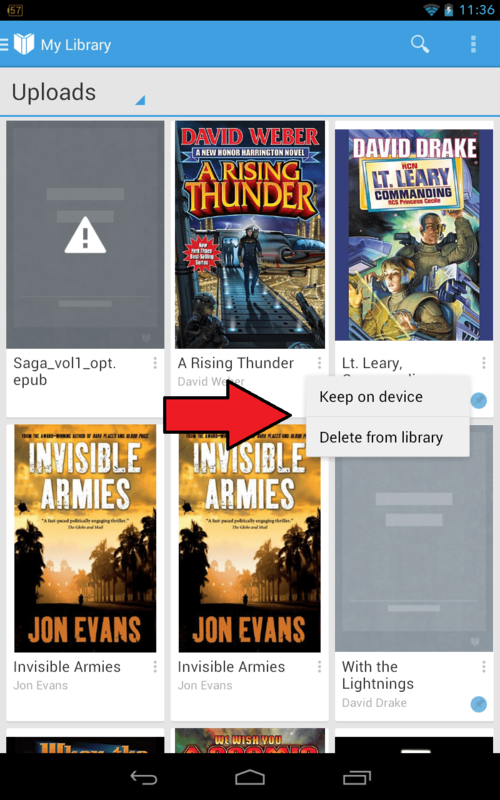 Can I remove a book from my device after uploading it to Google Play Book to free space? yes, but I wouldn’t do that. You can’t download the original file from Google, just read it in Play Books, so you should keep the original.